New planetary formation models from Carnegie's Alan Boss indicate that there may be an undiscovered population of gas giant planets orbiting around Sun-like stars at distances similar to those of Jupiter and Saturn. His work is published by The Astrophysical Journal. The planets predicted by Boss in this study could hold the key to solving a longstanding debate about the formation of our Solar System's giant planets out of the disk of gas and dust that surrounded the Sun in its youth. 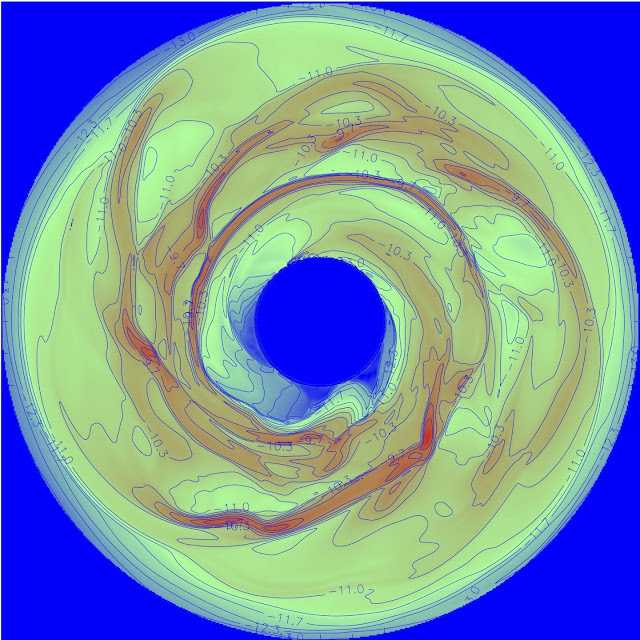 Boss' model of a planet-forming disk, which demonstrates that gas giant planets could be found orbiting Sun-like stars at distances similar to Jupiter and Saturn. The disk extends from 4 to 20 times the distance of the Earth from the Sun. You can see the spiral arms forming in the midplane of the disk. The disk instability theory suggests that gas giant planets can form from the clumps seen in the densest regions of the spiral arms. One theory holds that gas giants form just like terrestrial planets do--by the slow accretion of rocky material from the rotating disk--until the object contains enough material to gravitationally attract a very large envelope of gas around a solid core. The other theory states that gas giant planets form rapidly when the disk gas forms spiral arms, which increase in mass and density until distinct clumps form that coalesce into baby gas giant planets. One problem with the first option, called core accretion, is that it can't explain how gas giant planets form beyond a certain orbital distance from their host stars--a phenomenon that is increasingly found by intrepid planet hunters. However, models of the second theory, called disk instability, have indicated the formation of planets with orbits between about 20 and 50 times the distance between the Earth and the Sun. "Given the existence of gas giant planets on such wide orbits, disk instability or something similar must be involved in the creation of at least some exoplanets," Boss said. "However, whether or not this method could create closer-orbiting gas giant planets remains unanswered." "NASA's upcoming Wide Field Infrared Survey Telescope may be ideally suited to test my predictions here," Boss added.